Of all the candidates, only Sanders proposes an alternative to the neoliberal model of higher ed. By Heather Gautney and Adolph Reed Jr. It is hardly news that higher education has become increasingly difficult to access for more than three decades in this country. The proximate causes also are well known: escalating costs, stagnant incomes, and a shift away from federal grants to marketized student loans. This problem has long since reached crisis proportions for many people. Some are deterred from even considering a college education. Those who do graduate are often saddled with crippling debt. Moreover, concerns about cost and debt often distort selection of programs of study, undermine completion, and encourage elaborate strategizing—including attending multiple institutions—to minimize costs. The neoliberal fantasy that it is possible to “do more with less” has both driven and obscured the deeper source of this problem, i.e., the steady retreat from the principle that providing for the general welfare, including a baseline of services that enable all members of the society to realize their human capacities, is a fundamental role of government and should be among its highest priorities. That principle has given way before a steady bipartisan assault on public goods of all sorts. Public higher education has become particularly vulnerable to this juggernaut in the aftermath of the Great Recession as state governments have invoked fiscal stress to justify often draconian cuts in funding for public colleges and universities. Sanders’s plan would eliminate undergraduate tuition at four-year public colleges and universities. It would also take serious steps to relieve and reverse the burden of student-loan debt by enabling borrowers to refinance their loans and by cutting interest rates for undergraduate students almost in half. In 2010, Obama signed a series of laws that made it easier for borrowers to repay their student loans and avoid default through income-based repayment, in addition to some forms of loan forgiveness for public servants and long-term debtors. That same year, total outstanding student-loan debt surpassed that of credit cards, over the $1 trillion mark, spurring progressive senators like Elizabeth Warren to call out the US government for offering lower interest rates to Wall Street bankers while siphoning obscene profits off the backs of America’s students. Much of the political discourse on higher education reiterates this framework, with politicians and advocacy groups vying for ways to mitigate the debt crisis, skirting around the crux of the problem. Even Hillary Clinton’s New College Compact acknowledges the need for “debt-free college,” but her solutions replicate privatized, “human-capital” models of higher education that assume family contributions, are outcome-contingent, and involve student work requirements, perhaps some of them in the private sector. And it positions higher education as an engine of “global competitiveness,” rather than an institution for democratic citizen-making and conduit of social solidarity. The neoliberal consensus among conservatives and liberals alike has ghettoized the very idea of “the public,” with claims of a private-sector monopoly on high performance, innovation, and efficiency as markers of success. Conservatives go so far as to deride education and other public institutions as giveaways—or, as Jeb Bush put it, “free stuff.” But both sides deploy ideologies of austerity to paint free public higher education as unaffordable or, at minimum, cost-ineffective. 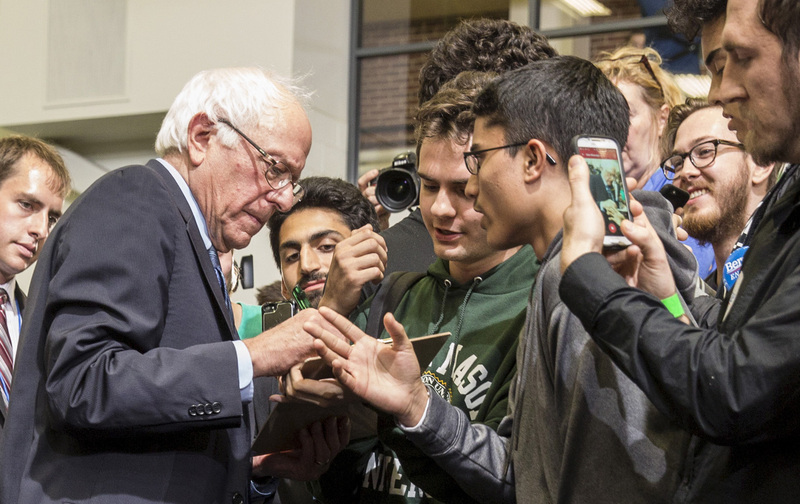 Sanders’s College for All offers a way out of a corrupt system that ensnares masses of young people in the prison of debt, and holds them and their families personally responsible for the skilling of the nation. His proposal involves a federal-state partnership, in which the federal government would cover 67 percent of the cost, with states responsible for the rest. To qualify for federal funds, states would need to meet a number of requirements, some of them involving significant improvements for academic labor, like reducing universities’ reliance on low-paid adjunct faculty and strengthening tenure systems. The rub for the consensus-bearers in political power is that costs would be offset by a tax on financial speculation—a Robin-hood style wealth transfer from Wall Street to working families. Even some liberals will pooh-pooh this proposal as pie-in-the-sky or inconsistent with putative American values, despite powerful precedents in lived American history. Under the Servicemen’s Readjustment Act of 1944, a k a the GI Bill: the federal government–funded education grant for all veterans returning from World War II that covered tuition, lab fees, books, health insurance, and supplies. Students received living stipends for dependents, in 2015 dollars, of up to $19,035. By 1952, the federal government had spent $125,706,792,450 in 2015 dollars on education and job training for 7.8 million veterans, half of which went to college and graduate-school expenses for 2.2 million GIs. The point is clear: We’ve done it before, and we can do it again. It is a matter of political will. We believe that Bernie Sanders’s candidacy can be a clarion call to galvanize millions of working- and middle-class Americans to fight for a policy vision that can invigorate the public, and make paramount our interests and concerns. Heather GautneyHeather Gautney is an associate professor of sociology at Fordham University. She is a volunteer on Bernie Sanders’s presidential campaign and a co-organizer of Higher Ed for Bernie. Adolph Reed Jr.Adolph Reed, Jr. is a professor of political science at the University of Pennsylvania. He is a volunteer on Bernie Sanders’ presidential campaign and a co-organizer of Higher Ed for Bernie.